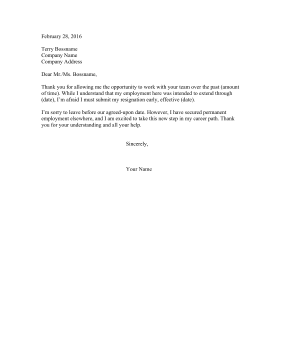 This resignation letter is for temporary employees who need to leave due to acquiring a permanent position elsewhere. Thank you for allowing me the opportunity to work with your team over the past (amount of time). While I understand that my employment here was intended to extend through (date), I'm afraid I must submit my resignation early, effective (date). I'm sorry to leave before our agreed-upon date. However, I have secured permanent employment elsewhere, and I am excited to take this new step in my career path. Thank you for your understanding and all your help.